The imagery used in this collage appear to come from my personal iPhone 7 plus, and on Google, by modifying the image – tool settings so that the usage rights are labeled for noncommercial reuse with modifications. I chose the image of my friends and I, along with the “Welcome to California” sign because I wanted to show where we were when we took the picture, hence somewhere in the world. . Along with the apocalypse and world photo, I wanted to kind-of create this dystopia of a destruction-type-world that we (us in the photo) are a part of yet show a unique spin-off to it. A digital collage that I threw together for Project 1 in DTC 201. Collage created by Kaleb Parrish, September 2018. The elements that I used in this project were size, texture, colour, and value. I wanted to make the apocalypse and world the main focus of the collage, so I made them the biggest. 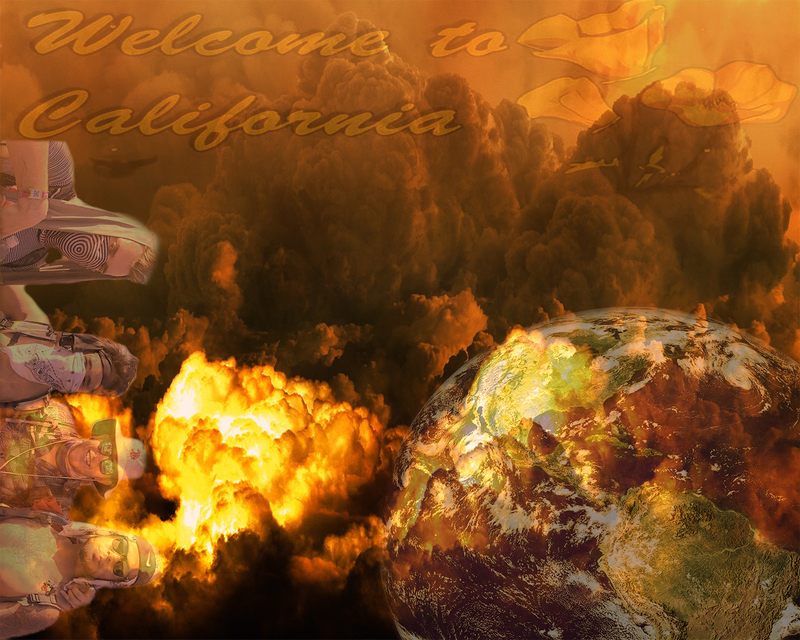 However, the cropped-out picture of my friends and I, as well as the “Welcome to California” sign, I wanted it to still have a big enough size to still play a part in the collage, so I had it scaled to a definite smaller size. The texture, colour, and value, I wanted them to kind-of intertwine each other so I played with the hue so that it would come off as a glossy collage. My eye moves from the center of the composition where the apocalypse and world destruction meet, but one could also look from left to right or right to left when looking through the composition because everything seems to fit together, especially if the image took a 90-degree turn, or even 180-degree turn. As for Principles that were incorporated in my piece, I would say the gradation and contrast both play a part in which some parts of the collage transition from lighter to darker tints and vice versa. Also, I hope that viewers would interpret this collage like I mentioned before, I wanted to create this dystopia of a destruction-type-world, but also have a spin-off off creativity by adding my friends. To me, it means that no matter what is going on in our world today, we still can come together and make the most out of our lives by traveling and having fun. The specific tools and function that I mostly used in this piece were the eraser tool when I had to erase most of the photo where my friends and I are posing which took the longest to try to make it erase all of the nonsense that was already in the photo. Then I added another layer to the world and wanted to make that color, as well as the color of my friends and I the same as the apocalypse so I had to mess with the hue and opacity so it blended in. Same for the “Welcome to the California” sign so everything would flow but because of the original photo of the sign, I had to use the blending tool to help blend it in the background, so it would all flow. This work needed to be constructed digitally because I wanted to make it seem as if it could be printed out as a poster. Granted, some of the artwork like the apocalypse and the world could be from a magazine or maybe drawn by hand, but I think it looked better digitally because I could bring out the colors and make it seem as if one.